Indium tin oxide (ITO) films are the premier choice of transparent conductive electrodes in optoelectronic devices, we find this material in almost all of today’s gadgets, from e-readers to light emitting diodes, from touch screens to solar cells. However, in the race toward lighter and flexible devices, ITO usage is limited due to its inherent brittleness. In a research project leaded by UNC graduate student Qian Dong under the direction of prof. Lopez and support from the thin film division of Eastman Chemical Company, a solution to this wide impact physical industrial problem has been developed with the fabrication of a simple ITO grating-like structure. Without altering the material at the atomic level, using this nanoscale structure, it is shown to overcome its mechanical limitations while retaining its resistivity and optical qualities (figure 1a). 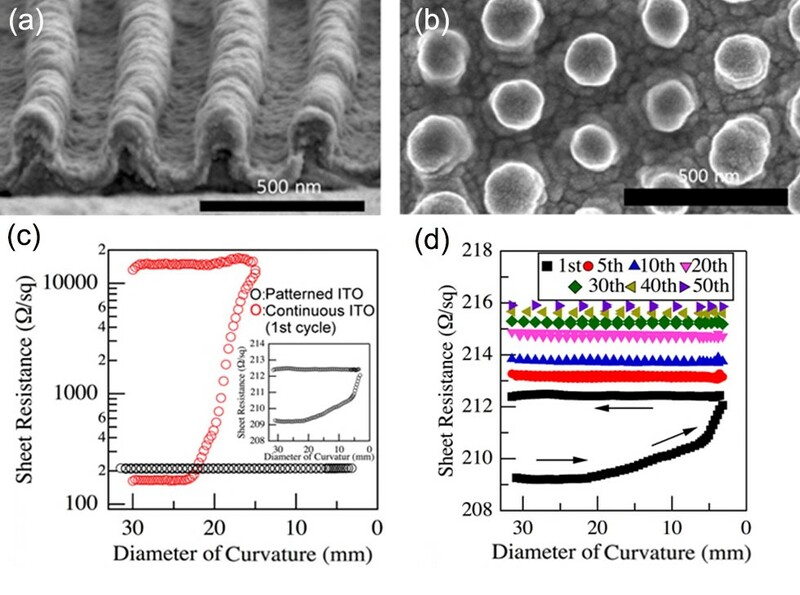 The ITO nanopatterned film exhibited a resistivity < 1.3 × 10−3 Ω cm, which surpassed all previously reported values for bendable ITO and a normal transmission > 90% in the whole visible spectrum range. The group demonstrated this nanoscale structuring indeed delivers extraordinary flexibility and durability on polymer substrates, bending to a curvature diameter of < 3.2 mm for over multiple cycles of compressive and decompressive flexing test, without significant resistivity or optical properties deterioration (figure 1d). For context, previous best results from competitors which combined standard ITO film and graphene, only bend down to 16 mm curvature diameter1, better to what Qian measured in conventional ITO films used as control samples (figure 1c), but a far cry from her results. In their recent publication2 and patent application, Qian has shown have shown also a suitable 2-dimensional extrapolation (figure 1b), where multiaxial bending is realized while maintaining the mechanical durability, high electrical conductivity, and optical transparency. It seems the time when graphene when would take over this important material application and business is not as imminent as once imagined. Figure 1. (a) and (b) panels show electron micrographs of the ITO patterned structures for 1D and 2D bending, respectively. Panel (c) presents the sheet resistance comparison between the ITO periodic grating pattern and a conventional continuous film on a polymer substrate as a function of diameter of curvature during the bending test, inset shows a magnified linear scale. Panel (d) shows the change in sheet resistance during multiple bending tests down to 3.2 mm curvature (apparatus limited). 1 S.J. Lee, Y. Kim, J.-Y. Hwang, J.-H. Lee, S. Jung, H. Park, S. Cho, S. Nahm, W.S. Yang, H. Kim, and S.H. Han, Sci. Rep. 7, 3131 (2017). 2 Q. Dong, Y. Hara, K.T. Vrouwenvelder, K.T. Shin, J.A. Compiano, M. Saif, and R. Lopez, ACS Appl. Mater. Interfaces 10, 10339 (2018).